Venus, our beautiful but inhospitable neighboring planet, outshines everything in the sky but the sun and the moon. It is in the midst of a lengthy evening appearance (shown here on Dec. 2, 2016, at 6 p.m. local time) that will last until March 2017. Over the next few weeks, it will swing further from the sun, reaching greatest eastern elongation at the outer tip of its orbit, on Jan. 12. As the winter evening ecliptic tilts higher, it will raise the planet, making it optimal for viewing in a small telescope. From now through the end of winter, the eye-catching planet Venus will shine brilliantly in the western evening sky. It's been hugging the horizon for months, but the turn of the seasons will soon lift it higher, to an ideal observing location even in a small telescope. Venus' orbit between the Earth and the sun creates a number of interesting phenomena in the way it looks and moves. In this edition of Mobile Stargazing, we'll look at Venus' properties using planetary apps, explain the motion of the planet through the sky, and provide some tips for observing and photographing the "Evening Star." In many respects, Venus is Earth's sister planet. Its radius is only 5 percent smaller than Earth's, and it's 18 percent less massive than our planet. Its mean distance from the sun is 0.723 astronomical units (AU), or about three-quarters the mean Earth-sun distance — putting it slightly inside the habitable zone for our sun, where liquid water can exist on a planet's surface. Venus has an average density that's similar to Earth's, so scientists think it is made of similar silicate rocks and minerals. The Solar Walk app focuses on the planets and moons of our solar system. It includes 3D-rendered globes with feature labels, cutaways showing internal global structure, exploration mission lander and orbiter positions, and an extensive gallery of images, including the Venus Messenger mission 3D terrains. The angular momentum left over from the formation of the solar system causes all the planets to orbit the sun counterclockwise, as viewed from above, while rotating on their axes. The Earth's axial tilt of 23.44 degrees gives us our seasons. Mars, Saturn and Neptune have comparable tilts. But something bizarre has happened to Venus; its axis is tilted by a whopping 177 degrees, meaning that its north pole points almost south so that it now rotates "backward" or retrograde. Planetary-formation experts believe that early in the solar system's history, a massive object knocked Venus "head over heels." The SkySafari 5 app for iOS and Android includes the option to show the planet's axis. And things get even stranger. When an object of low mass orbits close to an object of much higher mass, tidal forces raised by mutual gravitational attraction, working over time, eventually cause the smaller object to stop rotating and remain with one face pointed toward the larger body. That's why we see only one face of the moon. The rotations of both Venus and Mercury likely have been slowed in this fashion. Venus rotates only once every 243 days! (In comparison, Earth rotates once in 24 hours, Mars takes about 30 minutes longer and the rest of the outer planets spin about twice as fast as Earth.) An observer on Venus would see the sun rise in the West and set in the East, but it would take 117 Earth days for the sun to rise, cross the sky backward and set — if they could ever see through the clouds! A number of space probes have been sent to explore Venus, but landers can survive on the planet's surface for only hours before being cooked and crushed by the heat and pressure. Orbiting spacecraft — including Venera, Pioneer and Venus Express — have studied the planet's atmospheric composition, gravity and magnetism. In the 1990s, the Magellan mission mapped 98 percent of the planet's topography using cloud-penetrating radar signals. High-resolution scans taken at different angles have enabled scientists to recreate 3D models of the surface that rival photographs in detail. The Solar Walk app for iOS and Android includes an extensive gallery of images from the probes, a 3D interactive globe of the planet's surface, a cross section through the planet's interior and details about the exploration missions. With only three exceptions, all of the features on Venus are named after female deities, famous women, mythological heroines and other female figures. (The three exceptions, Alpha Regio, Beta Regio and Maxwell Monte,s which is named after James Clerk Maxwell, were assigned before the feminine naming convention for Venus was officially adopted.) Many apps, including SkySafari 5, feature a high-resolution Venus globe with the features labeled. As December opens, Venus is shining brightly, low in the western evening sky. It's in the midst of a long evening appearance (also called an apparition) that lasts until mid-March of 2017. The planet has been hugging the horizon for months, but the turn of the seasons will soon lift it higher, making it ideal for observing in a small telescope. By keeping an eye on Venus over the next several months, you can see some interesting changes in its appearance. Venus and Mercury are called inferior planets because they orbit closer to the sun than Earth does. They are the only planets that can move between the sun and Earth — a position known as inferior conjunction. As they move around the sun, we see them illuminated from different angles, so their disks exhibit phases like the moon's. They also dramatically grow and shrink in size as our distance from them varies. The next-greatest elongation for Venus, the eastern, occurs Jan. 12, 2017. Although Venus takes 225 days to orbit the sun, the elongations don't occur every half an orbit because the Earth is also moving, and that can delay or advance the required geometry. Your astronomy app can show you how Venus moves and when the elongations will occur. For another demonstration, bring up the southern sky, set the app's time to noon, and zoom out to show plenty of sky. The sun should be roughly centered. It's easier to see Venus' motions if you switch off daylight in the app. 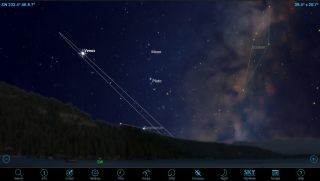 SkySafari 5, Star Walk 2, Stellarium and other apps allow this. Now, roll the date forward and backward to see the planet move through conjunctions and elongations. Mercury will do the same, although more quickly, and remain closer to the sun. Venus is a rewarding sight, even in the smallest telescope. But when viewed while low in the sky, through a thicker blanket of our atmosphere, it exhibits the same distortions that cause stars to twinkle. This animation was taken using a video camera at the eyepiece of a backyard telescope. It resembles what Venus looks like in early December 2016. To use your astronomy app to see the planet grow, shrink and change phases, center the planet and zoom in until the disk almost fills the display. Change settings to switch off the ground's visibility, and turn off the daylight. Then, flow time forward very quickly. For an interesting challenge, try to sketch or photograph Venus through your eyepiece from time to time over many months. For the best results, use the same magnification every time. As an observing target, Venus is so bright that any size telescope will work. When planets are low in the sky, they're shining through a much thicker blanket of atmosphere, which distorts the view. That's why planet observers plan to observe them during periods when the planets are high in the sky. To see the optimal times to view Venus in the coming years, you can advance the date in your astronomy app. Right now, Venus is only about 15 degrees above the southwestern horizon at dusk. Your view of it may be blurry, but the partial disk shape, about 17 arc seconds in diameter, should be readily apparent. Every evening until Jan. 12, 2017, the planet will climb higher in the sky while growing in size and brightness. After that, it will slowly swing back toward the sun, waning in phase but growing in diameter, as it heads to next spring's inferior conjunction. If the planet looks too bright in your telescope, try using the smaller hole in your dust cap or a moon filter. Chris Proctor captured this remarkable sequence of images of Venus between May 3 and Oct. 23, 2002. In that interval, the planet's disk grew from 11.4 to 59.3 arc seconds in diameter, and waned from nearly fully illuminated to a thin crescent. Because Venus is too close to the sun to observe at the conjunctions, this period runs from a few months after superior conjunction to one week before inferior conjunction. The images are positioned to reflect Venus' position in its orbit. Since long before Galileo first observed Venus' phases through his small telescope in the early 1600s, humans have been captivated by the planet's brilliant beacon in the sky. While it's fun to use a telescope to watch the phases of the planet change as it orbits the sun, that setup still only reveals its featureless white clouds. Adding a violet, red or dark-blue filter to your eyepiece should bring out some details in the clouds. You can also experiment with yellow, green and blue filters. Planetary imagers have found that using an ultraviolet (UV) filter reveals more structure within the clouds. And while you're enjoying Venus, try listening to the "Venus, Bringer of Peace" movement of Gustav Holst's The Planets suite on your device. It's lovely, just like the planet itself! Using a motorized 18-inch (46 centimeters) Dobsonian-style telescope he made, Jim Chung captured this image of Venus on April 14, 2015, from his home in Toronto. Details in the clouds were enhanced by using a commercially available filter that passed only ultraviolet wavelengths of light, giving it a bluish tint. In upcoming editions of Mobile Stargazing, we'll look at what's new in apps and gadgets. Until then, keep looking up!